Women in the Arts and Media Coalition: DON'T TELL ANYONE premieres on POV next Monday! leaders in a nationwide movement of young people." 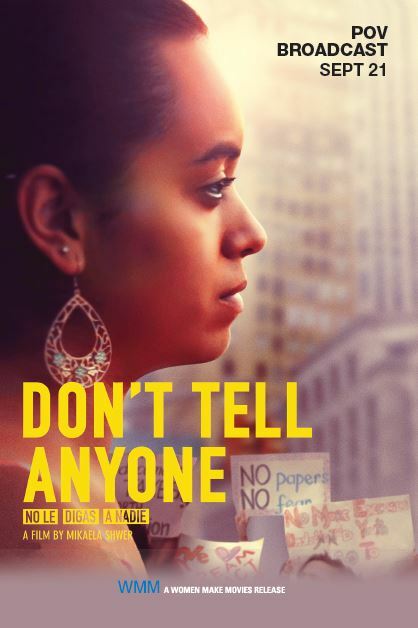 DON'T TELL ANYONE (NO LE DIGAS A NADIE), recently acquired by Women Make Movies, will have its broadcast premiere on the Peabody award-winning PBS series POV Monday, September 21 at 10pm EST. For more information on the broadcast click here, and check local listings for the showtime on your PBS station. DON'T TELL ANYONE (No Le Digas a Nadie) is a film about courage, facing insurmountable obstacles and the determination to fight for justice. The film follows Angy Rivera's remarkable journey from poverty in rural Colombia to the front page of The New York Times. Since the age of 4, Rivera has lived in the United States with a secret that threatens to upend her life: She is undocumented. In an environment where silence is often seen as necessary for survival, Rivera steps out of the shadows to share her parallel journey of being undocumented and sexually abused, an ordeal all too common in her community. Now 24 and facing an uncertain future, Rivera becomes an activist for undocumented youth with a popular advice blog "Ask Angy" and a YouTube channel boasting more than 27,000 views. Watch the trailer. Follow @nodigasfilm, @askangy and @womenmakemovies on twitter for updates, and use the hashtag #dontellanyonepov to be part of the national conversation!